This park was originally built by Warner Leroy and opened on July 1, 1974 who then sold the park to Six Flags in 1977. The original plan for the park was to have seven parks built in this complex which included a safari park, amusement park, botanical garden, show park, sports complex, a campground with beaches and stables, and a shopping district. The park just recently combined this park with its Wild Safari Animal park to become the world’s largest theme park at 510 acres. He also had several hotels that would all be connected to the parks via boats, busses, monorail/skyride, and busses. Unfortunately, only two of these parks were ever built which were the amusement and safari parks. This park has a total of thirteen themed areas which are Main Street, Fantasy Forest, Adventure Alley, Adventure Seaport, Safari Kids, Looney Tunes Seaport, Movie Town, Lakefront, Frontier Adventures, Bugs Bunny National Park, Plaza Del Carnival, Golden Kingdom, and Boardwalk. I do believe I took photos during this trip but I can’t seem to find them. I will keep looking and will post them as soon as I can but I did shoot plenty of off ride videos of most of the roller coasters. This is the entrance and exit area of the park and it is where you’ll find mainly gift shops, the guest services building, a few restaurants including the famous Carnegie Deli, Johnny Rockets, Primo’s Pizzeria, and Cold Stone Creamery restaurants, and the Liberty Square Gazebo which is home to some seasonal shows. When the park first opened, this area was originally called Liberty Square and was not the entrance and exit area of the park. The original entrance was in the Boardwalk area, Six Flags then moved it to this area which was a more central location for the park. This was also the site of the Mr. Six Dance Party show from around 2007 to 2011 when Mr. Six was the Six Flags character. Here’s my video of most of the show as I came in just as a few minutes after the show started. At this point, you can turn left and go to the Fantasy Forest, Boardwalk, The Golden Kingdom, Plaza Del Carnival, and Frontier Adventures, or, turn right and go to the Movie Town, Adventure Alley, Adventure Seaport, and Lakefront areas. We’ll be turning left after flipping a coin and going to our next area. This area was designed to make visitors feel like they were children again with larger than life buildings, fanciful designs, and colorful paint. Originally this area included the Adventure Alley section as well but that was split off and rethemed in the 1990’s when Time Warner owned the Six Flags Chain of parks. This area has three rides and a few restaurants including the Yum Yum Café which was built to look like a giant ice cream sunday, Granny’s Country Kitchen, and Ben and Jerry’s Ice Cream. Houdini’s Great Escape opened here in 1999 and is housed inside the “Mansion” and is a Madhouse attraction from Vekoma. This attraction was closed when I was there so I can’t tell you anything about it but I did find a video on HeadDaniel’s YouTube channel. The next ride is called the Enchanted Tea Cups. This ride is your basic Tea Cups Spinning ride that was installed here in 1996. Those that have motion sickness should not ride this attraction as it does involve spinning. The attraction does spin even if you are not spinning you individual tea-cup. Here’s an off ride video from Theme Park Maniacs YouTube channel. The next ride is the Patrina Williams Carousel. This carousel is much older than the park as it was originally an English built carousel by Mr. Savage in 1881 and contains 24 jumping horses of which 12 are roosters. This carousel was built at a time when the United States was aggressively expanding westward. It is also one of the few carousels in the United States that runs in a clockwise direction. This carousel remained in England either in storage of with a traveling fair until 1973 when it was bought by Mr. LeRoy and installed at this very spot. This carousel was converted to run off electricity but it does still contain its steam-powered generator inside the carousel. Here are two videos I have of this carousel, one contains photos and the other is an on and off ride video. Now we’ll turn left and enter the Boardwalk which contains many rides, gift shops, games of chance, and restaurants including Nathan’s Famous Hot Dogs and the Garden State Grill which serves burgers including the Jersey Burger. Our first ride is the Dare Devil Dive which is an up charge attraction most commonly called the Skycoaster and it opened here in 1996. Our next ride is through the games of chance area and it is another up charge attraction called the Slingshot. This attraction launches you into the air and it opened here in 2011. Then it’s on to our next up charge attraction which is a go-kart track. After riding the go-karts, we’ll head to our first roller coaster called Superman: Ultimate Flight. This is a Flying Coaster from B&M that opened here in 2003. A flying coaster is where the track is above you and you are loaded in a seating position. After everyone is loaded and locked into their restraints and all the safety checks have been performed, you are then raised into your flying position, then the train gets released from the station to ascend the lift hill. Once the train comes back into the station, the seats are then lowered back to the seating position and the riders as released from their restraints. This coaster opened here on April 17, 2003 and is 106 feet high, 2,759 feet long, has two inversions, a top speed of about 51 mph and a ride time of just over two minutes. I recommend you ride in the front row for the first time as you won’t see the feet of the riders in front of you. This is definitely a unique experience especially during the Pretzel Loop after the first drop where you are literally on your back at the bottom of the loop. now it on to our next coaster called Green Lantern. This coaster was formerly the Chang at Kentucky Kingdom before Six Flags pulled out of their lease. It is a Stand Up coaster from B&M, that’s right, you stand up on this coaster. How is that possible you might ask? Well, you walk up to the coaster and straddle an adjustable bicycle style seat that has two handles on either side to adjust the height. Then a over-the-shoulder restrain comes down and latches to the bicycle seat via a seatbelt and then everything is locked into place and the train is dispatched to ascend the lift hill. Green Lantern opened here on May 25, 2011 and is 4,155 feet long, 154 feet tall, has five inversions, a top speed of 63 mph, and a ride time of about two and a half minutes. This coaster replaced a steel looping coaster from Arrow Dynamics called the Great American Scream Machine which operated here from 1989 to July 18, 2010. GASM was the tallest at 173 feet and fastest at 68 mph roller coaster when it opened. It should be noted that this was the first coaster to use pneumatically operated gates to control when the guests can board the train for loading. After we exit this coaster, out next ride will be a truly rare ride called the Parachute Tower. This attraction was built by Intamin and opened here in 1983 and is 250 feet tall. These type of rides were once all over the place, but there are now only a few still open. I believe this one is the only one left in the United States after the Texas Chute Out tower was demolished at Six Flags over Texas. Next up is a Top Spin ride from Huss Mfg called the Twister. This ride opened here in 1999 and will literally flip you over and over and over many times. Now we walk through the second games area in Boardwalk and then turn left and then left again and enter our next area. This area has a heavy Spanish theme complete with lights, music, and many stucco buildings with Spanish tile roofs including the station for El Toro which used to be the station for the notorious Viper steel roller coaster. This area originally was part of the Frontier Adventures area and then changed its name to Hernando’s Hideaway when the wooden roller coaster called Rolling Thunder opened. There are two attractions in this area one of which is called Tango and is a rocking and spinning family ride and the other is El Toro, one of the worlds best wooden roller coasters. There are also a few gift shops and a restaurant called La Cocina which serves Mexican food. El Toro is Spanish for the bull and it opened here on June 12, 2006 and it is very deserving of its name. El Toro is a wooden roller coaster that was built by Intamin using prefabricated wooden track pieces which really makes for a very smooth ride. This coaster really delivers an incredible ride experience as the first half is noting but airtime going over several hills and then the second half is nothing but twists and turns that are low to the ground and will keep your but firmly planted in the seat. Unfortunately, I was only able to get the first half of the ride and a little bit of the second half as the second half was hidden by the Rolling Thunder roller coaster which has since been removed. Here is an on ride view that was done by Theme Park Review WITH PERMISSION from the park. The on ride part begins at the 1:15 mark of the video. I recommend riding in the front row and then trying the back row as these provide two different ride experiences on this truly incredible roller coaster. This coaster is 4,400 feet long, 181 feet tall, has a top speed of about 70 mph, and a total ride time of just under one minute and forty-five seconds. The first drop is at a staggering 76 degrees which makes it one of the steepest wooden roller coasters in the world. Next, we journey to Asia. But, before we get to Asia, we’ll take a ride on a coaster that was between the two areas called Rolling Thunder. This coaster opened here in 1979 and was a racing wooden roller coaster that was built by Don Rosser and the legendary William Cobb and each track was roughly the same as the other. Both tracks were 3,200 feet long, 96 feet high, had a top speed of about 56 mph, and a total ride time of about two minutes and ten seconds. Sadly, this coaster gave its last rides on September 8, 2013 and was demolished shortly thereafter. Here’s an on ride video taken by Coasterforce on YouTube. This area was formerly called Bugs Bunny Land which was a kids play area which was them rethemed and opened in 2005. There are two rides, a Bengal Tiger exhibit, and a children’s jungle themed water play structure called Splashwater Oasis which opened in the same year, as well as a few gift shops and a Primo’s Pizzeria and a Cold Stone Creamery restaurants here. The other two rides are the worlds tallest and fastest drop ride called Zumangero: Drop of Doom which will open in 2014. It is 415 feet tall, has a drop speed of 90 mph and was built by Intamin. The ride superstructure is actually attached to Kingda Ka’s tower which itself is over 450 feet tall. The last ride is truly a king of coasters. Kingda Ka opened on May 21, 2005 as the worlds tallest at 456 feet and fastest at 128 mph roller coaster. This coaster is still the worlds tallest but has since lost the record as being the worlds fastest as the Formula Rossa roller coaster at Ferrari World in Abu Dhabi, UAE is now the worlds fastest roller coaster at just over 149 mph. 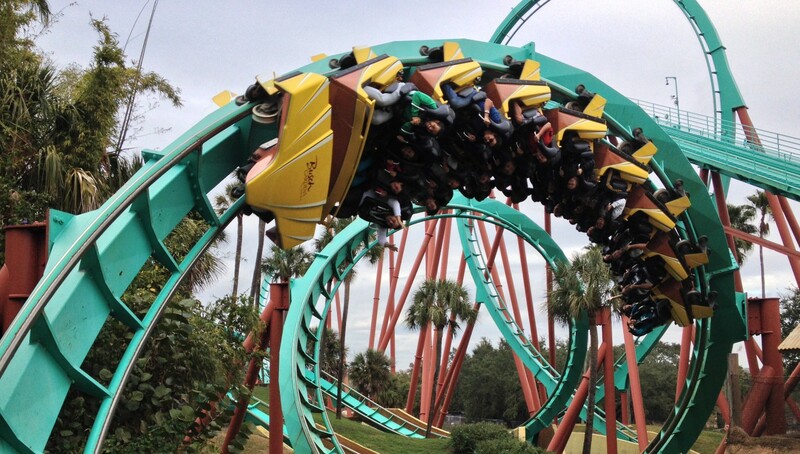 This coaster launches riders from 0-128 mph in just three seconds. The ride is 3,118 feet long, and has a total ride time of about thirty seconds and was built by Intamin. This coaster employs a dual loading and unloading station which allows up to four trains to load and unload in the same station on two tracks with track switch segments on both sides of the station. I recommend riding in the front row but please keep your arms down. For those of you that feel you can violate the parks rules and take cameras on roller coasters without permission, please watch this. This idiot thought it would be cool to take an illegal on ride video of his ride, well he paid the price as his camera was dislodged from his hand and it luckily fell harmlessly to the ground. The reason I say it luckily fell harmlessly to the ground is that the camera could have hit someone behind him, got lodged in the track or launching machine that does sit below the roller coasters tower forcing a delay of more than and hour-long. This is why parks have rules like this that you need to obey. Next, we’ll backtrack a bit and pass through Plaza Del Carnival and head to our next area on the right. This rustic kids area opened in 2006 with a series of camp themed kids attractions. Here is a list of all the attractions in that area which all opened in 2006. The Bugs Bunny Camp Carousel which is a traditional kiddy carousel with cartoon paintings on the rounding boards, the Bugs Bunny National Water Park Tower is a water tower that soaks guests, the Wile E Coyote Canyon Blaster is a kiddie Whip ride with race car themed carts. The Daffy Duck’s Hot Air Balloon is your standard circular balloon ride , the Porky Pig Camp Wagons is a standard wagon ride that goes around in a circle, and the Bugs Bunny Ranger Pilots is a standard airplane ride that goes up and down in a circle. Next we’ll come out the way we came in and turn right into our next area. This area carries a western theme and it has five rides including the Safari Off Road Adventure that opened in 2013 which took the place of the Six Flags Wild Safari in which people could drive their own cars through the environments. I chose not to do that when I was there in 2009 as I had a rental car which I didn’t want to get damaged at all. Here’s a brief video of what you can see from the tour courtesy of Theme Park Point of View’s YouTube Channel. The other four rides are the Saw Mill Log Flume which opened here in 1974. Riders board a boat that looks like a hollowed out log and they float down a flume around an island and then splash down next to the restaurant called the Best of the West which is a counter service restaurant pulled pork, salads, burgers, grilled chicken, and different kinds of soda and beer. The restaurant itself is pretty nice inside and it is air-conditioned as well. Here’s an on ride video from Sharp Productions on YouTube. Our next stop is a snack stand that is in the shape of a giant Conestoga Wagon, then there’s a giant outdoor arena that used to host a wild west show and has now been retrofitted to host touring musical acts. Then its on to our next ride which is the worlds first floorless roller coaster from B&M. A floorless coaster is where the riders are elevated above the track but have the floor removed while inside the station. This one opened in 1999 and was originally called Medusa. In 2009, the coaster was repainted, had an on board audio system installed and removed in 2013, off-ride effects such as flame throwers and misters installed, and renamed as Bizzaro. This coasters features seven inversions, is 3,985 feet long, 142 feet tall, has a ride time of about two minutes and twenty seconds, and a top speed of about 61 mph. I recommend riding in the front row for the first time and then the back as there are two totally different ride experiences and I also recommend riding at-least once at night as it is a totally different ride experience than riding during the day. Here’s my day and night off ride video. Next up is the parks oldest roller coaster called the Runaway Mine Train. It opened here on July 4, 1974 and was built by Arrow Dynamics and it has a top speed of about 38 mph with a total ride time of about two minutes. This coaster loads in a structure called the Fort and takes riders on a journey through the woods and over a small pond before returning to the Fort. We won’t have to go far for our next ride which is inside the Fort as well. This ride is actually ten years older than the park itself as it was first built at the 1964 Worlds Fair in Queens, New York. The ride is simply called the Skyway and it is the worlds only operating double skyride from Von Roll. This ride takes riders on a one way trip to the Lakefront area of the park where riders will have to disembark and get back in line for the return trip if they want to come back. A normal skyway or skyride attraction one out going lane and one incoming lane but this one has two of each. I love these type of rides as it is a really great way to get to another area of the park without walking and you get a bird’s-eye view of the entire park. Here’s my on ride video of this ride. It should be noted that this ride was originally going to be expanded to twice the length it currently is today and was going to connect with one of the proposed hotels that was never built. We’ve just now exited the Skyway ride and are now in our next area. This area contains several rides that carry a pirate theme as well as the Lakefront Theater were guests sit to watch fireworks over the lake on certain nights and Ft Independence stadium where a dolphin and sea-lion show is performed at different times during the day. There is a Panda Express restaurant here as well as a few gift shops. This area contains five rides as well as the Lakefront end of the Skyway ride. There’s the Buccaneer which is a Swing-ship ride that carries a pirates theme which opened here in 1980. It only swings back and forth and doesn’t invert riders. There’s also the Swashbuckler which is a spinning ride where riders stand up against the wall on the inside and the ride starts spinning. The ride then tilts up at about a forty degree angle and then back down at the end. Here’s an off ride video from Theme Park Maniac’s YouTube channel. This ride has been renamed, repainted, and moved to different spots but it has been here since the park opened in 1974. The next ride on the list is the Jolly Roger which is a spinning ride with a Skull in the middle and it’s been here since 1999. Ten there’s Skull Mountain which is an indoor roller coaster that is ridden in the dark. It was built by Goivanola and opened here in 1996. It is just over 40 feet tall, has a top speed of 33 mph, and a total ride time of just under one minute and thirty seconds long. Keep in mind that this coaster is in the dark, the park doesn’t turn on the lights unless it’s doing this for a club and only the members of that club ride it with the lights on. The final ride is a family roller coaster from Zierer. This is a large Tivoli model coaster that has an extremely long train that sounds like a tornado as the train goes through the course. It opened here in 1999 and is just over 1,181 feet long, just over 26 feet tall, has a top speed of just over 22 mph, and a total ride time of just over one minute. Here’s an off ride video from my YouTube channel. Next area is an adventure. This area contains two major attractions and two areas that contain five and six rides each. The two major attractions in this area are a river raft ride called Congo Rapids and a roller coaster called Nitro. The Congo Rapids is a river rapids ride that was one of the first of its kind to open when it opened here in 1981. You will get wet and possibly soaked on this ride which is why I chose not to ride it. I also couldn’t get any shots of the ride as it is fairly tucked away. The other ride is Nitro, a Hyper coaster that is one of the best non-inverting coasters I’ve been on. A Hyper coaster is one that has a hill or drop between 200 and 299 feet in height. It was built by B&M and opened here on April 7, 2001 to rave reviews and I can back them up as this is really an incredible coaster. It is 5,394 feet long, is 230 feet high, has a top speed of about 80 mph, and a ride time of about two minutes and twenty seconds long. This coaster is also a “L” shaped out & back design as well which means it goes out to a to a point, turns 90 degrees to the left or right then goes out to a point, turns around, then follows itself back to the station. I usually recommend what rows and/or seats to sit in to get the best air time (zero-g) feeling but there isn’t a bad seat as all of them get an equal amount of air time. This ride is further accented by the fact there’s only a lap bar to hold you in, the over-the-shoulder restraints aren’t needed as this coaster doesn’t invert riders at all. Here’s my off ride video followed by a legal on-ride video taken by Theme Park Review. The other two areas inside Adventure Seaport are kids areas. This area was originally called Looney Tunes Seaport but was rethemed in 2007 into Wiggles World which also included the area that was occupied by the Riptide Flume Ride. That area lost it’s Wiggles World theming when the naming rights expired in 2010 so it was rethemed again and given the Safari Kids name for the 2011 season. There are six rides in this area beginning with Raja’s Rickshaws which is a kiddie version of the Scrambler ride that originally opened here in 1982 in the now defunct Balin’s Jungleland area as was the Bugaboo which opened here in 1976. There’s also the Jumpin’ Joey which opened here as Sylvester’s Pounce & Bounce, Safari Tours which originally opened here as Taz’s Seaport Trucking Company, and Sky Zooma, this is a balloon ride which originally opened as Elmer Fudd’s Seaport Weather Balloons. All three of those previous rides opened here in 1999. Air Safari, a kiddie ride, was the only ride that was added that opened with the then new Wiggles World in 2007. This area opened here in 1999 as a part of the “War on Lines” year and this area contains five rides for the kiddies which all opened in 1999. There’s the Bugs Bunny Barnstormer which is a spinning ride, the Daffy’s Deep Diver which is a submarine themed ride, the Pepe Le Pew’s Hearts Aweigh which is a kiddie tea cups ride, Taz’s Tornado which is a kiddie swings ride, and the Road Runner Railway, a kiddie coaster from Zamperla that’s 13 feet tall, 262 feet long with a ride time of about twenty seconds. This area mainly has rides that are themed to the Batman movies from DC Comics as well as a few gift shops and a restaurant called Primo’s Pizzeria. There were several rides that had a movie theme to them like the Batman & Robin: The Chiller roller coaster which was a twin launched roller coaster from Premier Rides. It opened in 1998 and was removed in 2007. The Batman (blue track) side was 1,137 feet long, 200 feet tall, had one inversion called a Top Hat, had a top speed of 65 mph, and a ride time of about 32 seconds. The Robin (red track) side was 1,229 feet long, 200 feet tall, had two inversion in a Cobra Roll element, a top speed of 65 mph, and a total ride time of about 48 seconds. Here’s an off ride view from Theme Park Review’s YouTube channel. Here’s my look around at what remains of the Batman and Robin: The Chiller coaster as well as an exterior shot of the Batman: The Dark Knight indoor roller coaster. There were several other rides in this area like the Stuntman’s Freefall which was a First Generation drop tower ride from Intamin, Movietown Water Effect which was a Splashdown water ride from Intamin, and several flat rides like the bumper cars were removed along with many of the Hollywood theming on the buildings. That leaves us with just two rides in this area and both of them are roller coasters. The Dark Night Coaster is basically an indoor wild mouse roller coaster with sudden drops and sharp turns that is very well themed. It opened here on May 15, 2008 and was built by Mack Rides. It is 1,213 feet long, has a top speed of about 20-30 mph, and a total ride time of about two minutes. I recommend you hold on to the hand holds on this coaster as you really can’t see the turns and it will throw you around a bit. Here’s an on ride view from Sharp Productions YouTube Channel. The other coaster in this area is called Batman The Ride and it is the second oldest Inverted roller coaster in the world. The first Inverted coaster opened on May 9, 1992 and this one opened on May 1, 1993. It really is an incredibly intense coaster for its small size an I recommend you ride in the front row so you don’t get an obstructed view on your first ride. The ride time on this coaster is about two minutes and the 100 foot lift hill takes up almost a minute of that time so in just over a minute, it throws five inversions which consist of a loop, zero-g roll, a loop, and two corkscrew rolls in that order along the 2,700 foot long track at a top speed of 50 mph. You might think this a rough coaster but nothing could be farther from that as this coaster comes from B&M and they really have made some incredibly smooth coasters and this one fits that to a “T”. Here’s my off ride video of this coaster which includes shots of the themed queue that is based on the first Batman movie with Michael Keaton as Batman. Our next area is the last area let’s be adventurous. This area has a few gift shops and a small arcade as well as a few snack stands and beverage carts. This area is relatively new as it was the right half of the Fantasy Forest area as Main Street used to cut through Fantasy Forest until 2012 when that side of Fantasy Forest was renamed Adventure Alley. There are a number of different rides here but no roller coasters. The rides include Deja Vu, a Scrambler spinning ride with music, Fender Benders, a bumper cars ride, and Air Jumbo, a flying elephants ride that was relocated from the Golden Kingdom area. All of those rides opened here in 2012. There are two other large attractions in this area as well which include the Big Wheel which opened here in 1974 as the worlds tallest Ferris Wheel at the time. Here is an on ride video from uniracer13’s YouTube Channel of the Big Wheel as well as some nice off ride shots of the ride and some of the roller coasters. The last ride in this area is also the newest ride called SkyScreamer. This ride opened here on May 22, 2012 and stands 242 feet tall. There are two seats per gondola that are suspended by several very strong chains. Imagine this as a very tall Yo-Yo ride without the oscillation once it gets to the top. SkyScreamer is a Star Flyer model from Funtime and it was installed by Ride Entertainment Group. I haven’t been on this particular ride but I have been on a similar ride by the same company called the Star Flyer at the Florida State Fair but it isn’t nearly as tall and I found it enjoyable. Here is an on ride view of the ride from Theme Park Reviews YouTube Channel. You can really see how high it goes as well as the restraints they use to hold you in. Now we’ve reached the end of our journey but before we collect all our souvenirs, trinkets, and on ride photos that we’ve bought, lets take a look at what some of the rides look like at night. Unfortunately, this video is blocked in some countries so some of you may not be able to see this video I have on my YouTube channel called Themeparkfanatic. I hope you’ve enjoyed this comprehensive review of Six Flags Great Adventure as I really had a fun time while I was here in 2009.